Ross Dodd is a busy man. Ensconced inside the two-storey Ralph H Smith Scoreboard at Junction Oval he puts up the scores of the amateurs game being played below, the scores of the AFL games blaring from one of two radios, and the day’s race results, blaring from the second radio. The scores of the AFL games are not updated quarter by quarter, but as soon as Ross hears them, as soon as Rex Hunt barks them out. Ross does all this with a minimum of fuss. He changes the scores of the home team, Old Melburnians, from his seat in the middle of the scoreboard, on the second level. 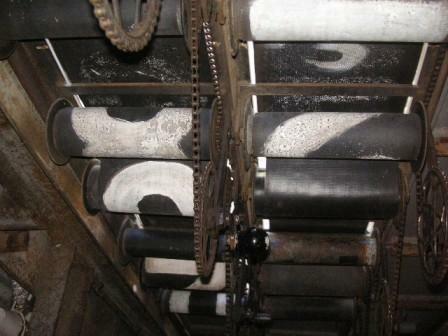 He leans over a little and rolls the handles of the triangular bicycle-chain pulleys. 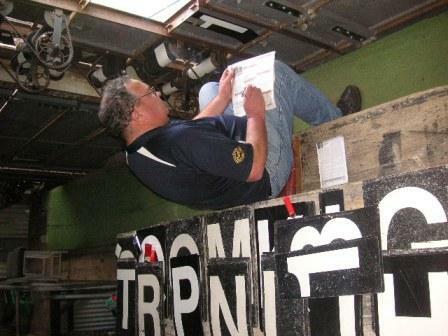 For the visitors team, he ambles carefully to the St Kilda Road side of the scoreboard and adjusts the pulleys. For the AFL games he heads in the other direction, to the Albert Park side, and slaps metallic numbers onto panels. And for the race results he goes downstairs and rolls the numbers over. From time to time Ross puts up a happy birthday message. In early May he spelt out Happy 7th Birthday “Julia” at the request of the St Kilda Cricket Club vice-president. 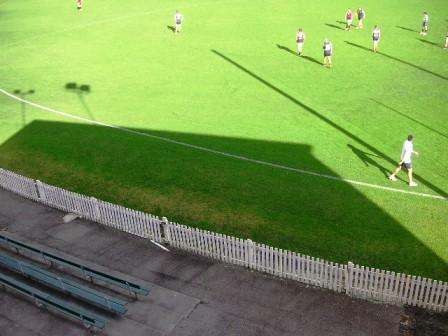 It is no exaggeration to say the Junction Oval is rich in history. It has been the home of Shane Warne’s cricket club, St Kilda, since October 1856. It was the home of the St Kilda Football Club from 1886 to the end of 1964 and Fitzroy Football Club’s home ground from 1970 to 1984. 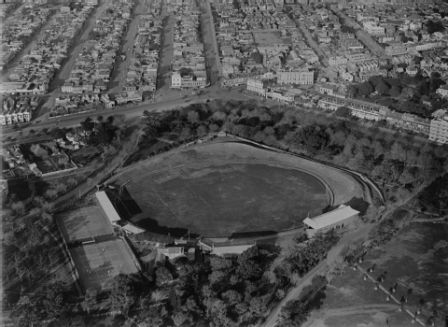 It hosted the first VFL grand final in 1898 and has hosted Sheffield Shield finals, VFA grand finals, a heavyweight fight between Joe Frazier and Jimmy Ellis, country week tennis, Highland Games, rugby union and more. Photo by Charles Pratt, July 1929. Courtesy of State Library of Victoria. 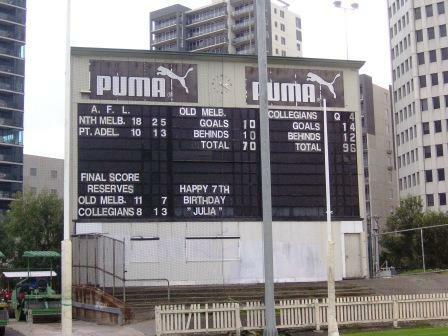 The current scoreboard, at the city or tennis courts end of the ground, was built in 1955 and named in honour of Ralph H Smith, a former St Kilda Cricket Club player and president, whose involvement at Junction Oval spanned 60 years, from 1898 to the summer of 1959-60. Photo courtesy of St Kilda Cricket Club. 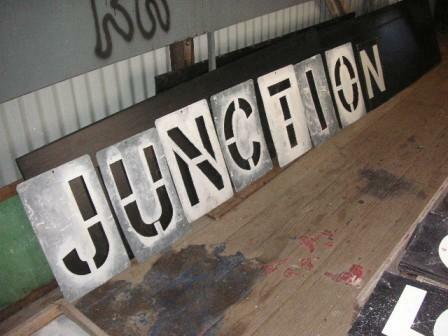 Similar in design but smaller in scale to the MCG scoreboard of the time (which is now at Manuka Oval, Canberra), the Junction Oval scoreboard measures 14 metres across, 12 metres high and four metres deep. 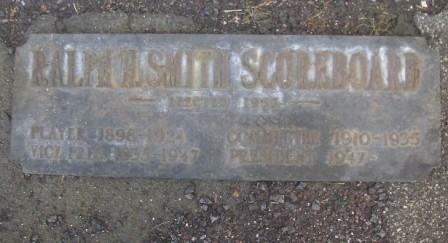 It has 30 steel name panels, for the names of batsmen, bowlers, football teams (and birthday girls like Julia). It has 190 number panels and 22 pulleys. Some of those pulleys would have been working overtime the day Fitzroy recorded the highest football score at Junction Oval: 34.16 (220) to North Melbourne’s 10.10 (70), round 13, 1983. The names of cricketers and teams used to be made with stencils and white boundary line paint, a messy, time-consuming activity that didn’t quite factor in the possibility of rain smudging the letters. 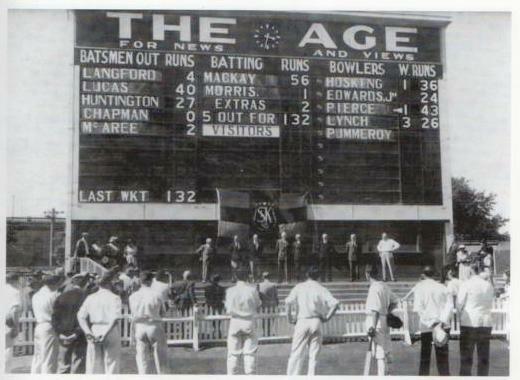 (Then again, the scoreboard was originally for cricket.) Nowadays changing names is just a matter of Ross collecting the neatly stacked magnetic letters from the bench behind his throne and spelling them out on the panels. “They don’t fall off,” he says. Ross Dodd likes to get to work early. He packs a sandwich, his cigarettes and his newspaper and catches the train and the light rail from the northern suburbs to make his way to St Kilda by nine o’clock. The public transport is a break from a week of delivering spare parts and a chance to read the sports pages. 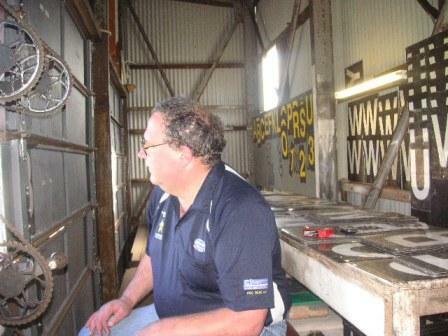 Ross was a goal umpire for local leagues for 17 seasons and official scorer for Victorian Cricket Association Clubs, mainly St Kilda, for 30 seasons. He knows numbers and he knows his players. Watching a ponytailed full-forward for Old Melburnians reserves lining up a shot at goal he says, “Not a bad kick, this bloke,” and reaches for the pulleys as the ball sails through the goals. Given that all of Junction Oval is heritage-listed, the Ralph H Scoreboard’s future is assured. It’ll never be knocked down. However, there is the possibility of an electronic scoreboard one day being built at the ground. Will it have room for all of Ross’s results? The main game, the reserves, the AFL, the races? The Jim Pavlidis lithograph of the scoreboard’s busiest day.